The Colorado Plateau is located in the three states of Arizona, New Mexico, and Utah, with the central point lying just slightly west of the four corners area. The modern topography of this region contains, arguably, the world's most beautiful canyon country, arches, and desert landscapes known to man. Just to rattle off a few from an impressive list: Arches, Canyonlands, Grand Canyon, Bryce Canyon, Zions, and Capital Reef National Parks. Also found within this region are the laccoliths (Abajo, Henry, and La Sal mountains) of South Eastern Utah, Lake Powell National Recreation Area, and Escalante Grand Staircase and Natural Bridges National Monuments. The Colorado Plateau has maintained a relative stability over the past 600 million years, this is unlike all the areas that are found along it's borders (Rocky Mountains, Wasatch Mountain Range, Uintah Mountains, Basin and Range Province). The Grand Canyon is one of the wonders of the world and is especially useful to geologists for it's stratigraphical rock record, dating all the way back to the Precambrian with 2 billion year old rocks! 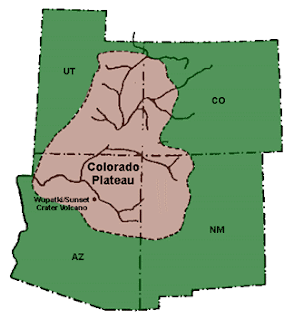 The Colorado Plateau region has been one of continual change throughout geologic time. In the Paleozoic era it was periodically inundated by ocean water from the east, thus forming thick layers of siltstone, limestone, sandstone, and shale from shallow marine water deposits. About 250 million years ago this region was greatly affected by mountain-building events (called orogenies) that caused widespread crustal uplift and formed new mountains obviously. The area then became a drainage plaine for the mountains that were to the west of the Colorado Plateau Area. These streams and lakes, made from the drainage of the western mountains, formed the Chinle, Moenave, and the Kayenta formations of the Mesozoic. Skipping much of the history we arrive at a more recent era of the Cenozoic where more uplift occurred, resulting in an increased gradient level. The streams of the region then started cutting down through the rock and formed much of the canyon country we now know today. Mass wasting and erosion of the cliffs produced spectacular buttes, mesas, and plateaus. The geologic history is rich and extensive, if you're interested in a more complete report of this area see http://www.blm.gov/education/colplateau/diversity/ and even though Renee doesn't like it, there's a lot of good information at http://en.wikipedia.org/wiki/Colorado_Plateau. The Colorado Plateau is home of some of the best, if the not THE best wild desert country in the world, take every advantage you can to go and see it.